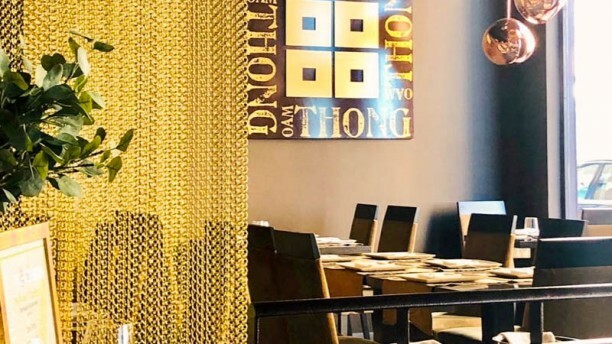 "Authentic cuisine Thai in a luxury setting due to its decor, atmosphere and exquisite service exists and it is in Madrid. It's the Sanuk restaurant, located in Las Tablas neighborhood. All products are brought expressly from Asian so the food is completely genuine. On the menu you will find culinary delights such as the treasures of the Mae Nam Khong or the most acclaimed by customers such as the Goong tod maphraw, which are fried prawns. Satay gai, delicious skewers marinated in spices are on high demand for regular clients. If you like meat, you will love to try the beef cheek. Asian cuisine also has a few top quality seafood dishes. Try the prawns in coconut cream. Simply spectacular. Sanuk is one of the best options to entertain someone, or for a business meal or with family or as a couple. Without a doubt, the best Asian in Madrid. If you don't want to miss it, make your reservation now and see for yourself!" Always wonderful food and the service is outstanding too! Regular customer and the food and welcoming atmosphere never disappoints! Thank you, Mark and family, for your great review and, even more, for being part of us! Great to see you again, whenever you feel having great thai food at Oam Thong!!! Comentarios tan al superlativo como el tuyo, enorgullece nuestra dedicación a esta cocina tan variada y arómatica! Gracias y gracias!!! Guay del paraguay, todo muy rico. Estupendo, Kathy! Gracias por tu buenísima valoración y te esperamos pronto en nuestra casa. Muchas gracias por tu inmejorable valoración! Un placer verte de nuevo en breve! Thank you for your nice feedback! Please note that we will try our best to improve your overall experience with us. Kind regards and hope to see you soon! Inmejorable feedback, Laura! Muchas gracais de todo el equipo de Oam Thong! Very nice as I expected. Big plates excellent quality and spicy! Un ambiente muy agradable y tranquilo, saboreando unos platos exquisitos.